The widow of a man who died when a tipper truck crashed into him said being told her husband was dead felt like "an out of body experience". Stephen Vaughan, 34, from Swansea, was one of three men in a car who were killed when a lorry crashed on a hill in Bath in February 2015. 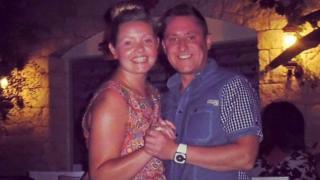 Mr Vaughan's wife Sian said the death of her "larger than life" husband left her feeling "completely lost". The couple had been together for just over four years and married in 2014. Robert Parker, 59, from Cwmbran, and Philip Allen, 52, from Swansea, also died in the car with Mr Vaughan while four-year-old pedestrian Mitzi Steady from Bath was also hit and killed by the truck. Mrs Vaughan said: "People say I've been very, very strong. I don't feel strong. It's just I think what Steve would have wanted me to do." Describing how her husband's friends and relatives have been affected by his death, she said there has been "a ripple effect". "For Steve's mum and dad to lose their son is probably the worst thing that has happened in their lifetime. "And I didn't realise how popular Steve actually was until the day of his funeral when nearly 800 people turned up. "People came from everywhere and told me some fantastic stories about him." She said her "cheeky chappie" husband was someone who "everybody liked". Mrs Vaughan described hearing evidence in court during the trial of the two men convicted of causing her husband's death as "very difficult". She said it was hard to hear "that things could have been avoided". "I could have had Steve here now by my side and would never have had to go through all this," she added. "Hopefully if that was the case we would have had a family by now, which we've been denied. Whereas the owner of the company has gone on to have a child and has one on the way as well. "So I feel very upset that he's gone on to have a life, and mine's been taken away from me."